GREAT NEWS: during February 2018 you can win my Gardening by Design ‘Box of Tricks’ video gardening tutorials absolutely FREE in an Amateur Gardening Magazine competition. There are ten copies of the videos on offer. The competition is run online by the magazine and their terms and conditions apply. click here to go to the website & enter the competition. I am just supplying the fabulous prizes. The Gardening by Design Box of Tricks is here to help you because “The only Trick you need is Knowledge”. You can add to your gardening knowledge and understanding one topic at a time, whenever you like with practical advice on video, for you to use in your garden, explaining the why as well as the how and helping you to understand what works and what does not. 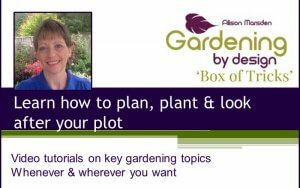 Giving you the confidence to plan, plant and look after your plot. All the videos are structured so you can watch in easy to manage sections and get out into the garden in between to make the most of the information. There are plenty of photographs, diagrams, examples and summaries to help you get to grips with the topic. Click here for details of the Box of Tricks, download a free video nugget on Ways to beat Weeds and buy the full topics.